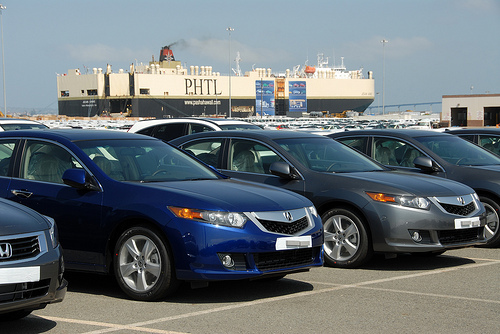 Terminal-to-terminal car shipping companies offer a hassle free way for individuals to ship cars and other vehicles from one point to another. In many cases, terminal-to-terminal shipping is considerably less expensive than door-to-door car shipping services. The service is a great option, especially if you are moving to a new city or town but haven’t found a place to move into yet. A transport terminal is basically a sort of secure parking facility for cars and other vehicles. Many large terminal-to-terminal auto transport services locate their regional terminal facilities relatively close to major metropolitan areas. A customer who wants to transport his or her car to a new location can simply drop the vehicle off at the nearest terminal facility. The auto transporter then loads the car onto a car-hauling truck and transports it to the company’s terminal at the destination city, where the customer can then pick up the vehicle. The process is a relatively painless way to ship a car, especially if you happen to live close to the shipping company’s terminal facility. Many high-volume car transporters offer discounted pricing for terminal-to-terminal auto transport services because the process eliminates the need for them to go to a customer’s location to pick up and drop off a vehicle. Importantly, terminal-to-terminal car shipping gives transport companies a way to consolidate loads more efficiently and generally reduces the time it takes for them to transport cars from one point to another. The first thing you need to do if you are interested in using terminal-to-terminal auto transport services is to obtain and compare price quotes from multiple car transporters. One major factor to remember is that not all auto-shipping companies offer discounts on terminal-to-terminal shipping. In fact, most vehicle-shipping these days is done door-to-door. Therefore, some transporters may actually charge you more for terminal-to-terminal shipping. The distance from your location to the shipping company’s terminal is another major consideration. If the terminal is too far away, you need to factor in the costs involved in driving your car to the terminal and picking it up from there at your destination. Sometimes, the costs involved in dropping off and picking a car up for a transport terminal can neutralize any cost-benefits you might have otherwise derived from using a terminal-to-terminal option. Always make sure that any shipping company you choose is fully licensed and insured. Check with the auto transporter whether your car will be transported to its destination in the same truck, or whether it will be unloaded and loaded onto multiple trucks. Generally, the chances of your car getting damaged during transit increases the more it is loaded and unloaded onto trucks. Price should not be the only consideration when choosing a terminal-to-terminal car shipping company because, sometimes, the lowest cost option may not be the best option.